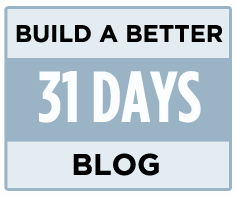 If you are not familiar with it, Darren uses to run a very useful series on his blog titled “31 Days to Build a Better Blog.” He basically takes one month out of the year and packs it with practical articles that people can use to improve their blogs. The idea behind this is simply to have a group of bloggers setting aside a month of their time to work at improving their blogs. While we all want to have better blogs sometimes it becomes one of those things that we’re going to do…. one day. I personally find that I improve (in all areas of my life) when I’m more intentional and set aside a specific time to make the improvements. That’s what this project is about. Yesterday on Twitter I mentioned that I was thinking of running this again and had 50 people express interest in 5 minutes. I quickly set up a sign up page just for my Twitter users and within 24 hours had well over 1000 registered participants. I guess people want to do it. If you are looking to improve your blog during April, I would recommend signing up for this. First of all it will give you an extra motivation to actually take action instead of just sitting around reading your RSS feeds…. Secondly, Darren will also pack some bonuses for the people who join, so you can’t lose. I am very new to this blogging and online marketing field but even in a short period of time I have heard many good things about problogger. So, I am going to buy this book hoping to do my crash course in blogging in 31 days. Thanks for the recommendation, I have signed up. Where do you sign up? It is already into April but I just found out about this. Started my blog about 60 days ago, but I could use all of the advice. I’m enjoying it, but I know that I’m missing out of a lot of things to do to help promote and share it! Thanks for the insight-I look forward to committing the time in April! I saw it on his blog yesterday and signed up. I’m looking forward to it. I just did a post about it this morning as well. I already signed up and am looking forward to giving the course a shot. I hope it’s as good as the last ones. Yep, I’m signed up! Looking forward to it. Sounds like a great idea. Should be a habit to improve your blog. This will be the beginning of creating that habit. I already signed up and organizing a “study group” with fellow Italian bloggers. Any Italian blogger reading this is invited. Thanks for the headsup! If I ever recover from this cold, I’ll sign up to participate. In any event, I’ll alert my network…thanks! I joined two days ago through Twitter, and I cannot wait ’til April 1st! I have followed Darren’s previous 2 installments, and now i have signed up this one for that little extra he will mail to readers who signed up.